Super Bass Clinic at the Ultimate Fishing Show Detroit! NEW – Super Bass Clinic! Saturday, January 14th - 3-5 p.m. This is your chance to be involved in one of the most informative and innovative seminars this year. 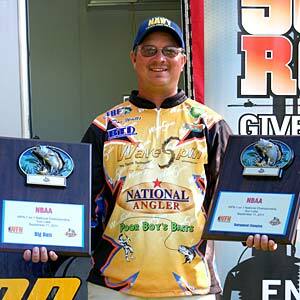 Michigan’s own Bass fishing pro Don Watts will be the featured guest speaker at this year’s Super Bass Clinic. Don is one of Michigan’s most accomplished tournament anglers. Here are just a few of Don’s angling accomplishments - NBAA Angler of the Year, TBF State Champion, 3 time National One On One Champion, 3 time NBAA Director Champion - including Cass Lake, 2008 Overtime Champion on the Ohio River, 2010 National Champion on Patoka Lake, plus dozens of local and regional top finishes. Some of the topics that are sure to be covered are jerkbait fishing, bouncing a Darter, jig fishing and crankbaiting in the weeds. These techniques have won Don thousands in cash and prizes. In addition to Don Watts, a Q&A Super Session will be held with some of the top regional tournament bass anglers - bring your questions on local bass angling. These top anglers will have the secrets to catching monster bass on your local lakes! Lakes such as Oakland, Pontiac, Lobdell, Lake St Clair, Cass, Orion, Kent, Union and more. This special 3 hour workshop is intended for anglers who want to climb to the next level in recreational or tournament fishing. A fee of $25 will be collected at the NBAA booth Thursday through Saturday morning. Children 12 and under are free with paid adult. Each paid attendee will receive a “free gift” valued at over $25. Plus, you’ll have a chance to win the Grand Prize Drawing. And if you sign up Thursday or Friday, you will also be given free admission passes to enter the show on Saturday for the clinic. Don’t miss this opportunity to learn from one of the best this state has to offer! Sign up early, seating is limited. Tickets - Cost $25, sign up and register at the NBAA booth. Children 12 and under are free with paid adult. Tickets and directions to the Ultimate Fishing Show can be purchased online at Ultimate Fishing Show Detroit or purchased the day of the event at the Suburban Collection Showplace box office. Don was excellent-great practical tips that could be immediately used. We were disappointed with the “free gifts"- a tee shirt and a coule of bags of plastics don’t add up to near $25 in value. Drawing was pretty poor as well-mostly inexpensive stuff that most anglers would not be buying. Don did a great job promoting the product that he used and I know that there were many sales after the talk by the vendors who carried his stuff. I personally purchased one of the spinning reels. So, the venders that supplied his gear should have ponied up more practical/useful gear for the bags and the raffle.